Here are some snazzy birthday facts about 16th of June 1978 that no one tells you about. Don’t wait a minute longer and jump in using the content links below. Average read time of 11 minutes. Enjoy! What day was my birthday Jun 16, 1978? June 16, 1978 was a Friday and it was the 167th day of the year 1978. It was the 24th Friday of that year. The next time you can reuse your old 1978 calendar will be in 2023. Both calendars will be exactly the same! This is assuming you are not interested in the dates for Easter and other irregular holidays that are based on a lunisolar calendar. There are 55 days left before your next birthday. You will be 41 years old when that day comes. There have been 14,920 days from the day you were born up to today. If you’ve been sleeping 8 hours daily since birth, then you have slept a total of 4,973 days or 13.62 years. You spent 33% of your life sleeping. Since night and day always follow each other, there were precisely 506 full moons after you were born up to this day. How many of them did you see? The next full moon that you can see will be on May 18 at 21:13:00 GMT – Saturday. Fun stat: Your first one billion seconds (1,000,000,000) happened sometime on February 22, 2010. If a dog named Alpo - a Scottish Terrier breed, was born on the same date as you then it will be 180 dog years old today. A dog’s first human year is equal to 15 dog years. Dogs age differently depending on breed and size. When you reach the age of 6 Alpo will be 40 dog years old. From that point forward a small-sized dog like Alpo will age 4 dog years for every human year. Emperor Julian marches back up the Tigris and burns his fleet of supply ships. During the withdrawal Roman forces suffered several attacks from the Persians. First Battle of Groix otherwise known as “Cornwallis’ Retreat”. At the Villa Diodati, Lord Byron reads Fantasmagoriana to his four house guests — Percy Shelley, Mary Shelley, Claire Clairmont, and John Polidori — and challenges each guest to write a ghost story, which culminates in Mary Shelley writing the novel Frankenstein, John Polidori writing the short story The Vampyre, and Byron writing the poem Darkness. The formation of the London Working Men’s Association gives rise to the Chartist Movement. The Battle of Morar takes place during the Indian Mutiny. IBM founded as the Computing-Tabulating-Recording Company in Endicott, New York. In a futile effort to topple Argentine President Juan Perón, rogue aircraft pilots of the Argentine Navy drop several bombs upon an unarmed crowd demonstrating in favor of Perón in Buenos Aires, killing 364 and injuring at least 800. At the same time on the ground, some forces soldiers attempt to stage a coup but are suppressed by loyal forces. Soviet Space Program: Vostok 6 Mission: Cosmonaut Valentina Tereshkova becomes the first woman in space. Bhutan becomes the first country to institute a total ban on tobacco. What does my birthday June 16, 1978 mean? Your birthday numbers 6, 16, and 1978 reveal that your Life Path number is 2. It represents balance, harmony and partnership. You have the soul of an artist. You are a fine companion and possess a good sense of humor. Friends seek you out for your calming and peaceful company. The following celebrities also have the same life path number: Jennifer Peña, Juhi Chawla, Michelle Stafford, Francesca Capaldi, Adam Baldwin, Andrew Rannells, Samantha Sang, Ciara Bravo, Daniel Henney, Sandra Lyng Haugen. What is the birthday horoscope for Jun 16, 1978? The Western zodiac or sun sign of a person born on June 16 is Gemini ♊ (The Twins) – a mutable sign with Air as Western element. The ruling planet is Mercury – the planet of communication. According to the ancient art of Chinese astrology (or Eastern zodiac), Horse is the mythical animal and Earth is the Eastern element of a person born on June 16, 1978. Fun fact: The birth flower for 16th June 1978 is Rose for devotion. 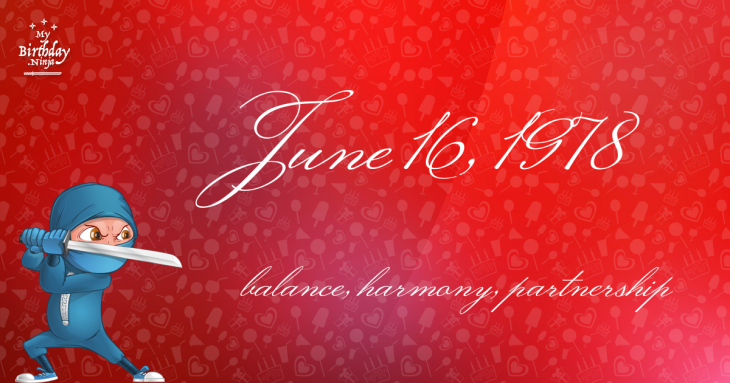 What is the Love Match for Jun 16, 1978? When it comes to love and relationship, you are most compatible with a person born on October 19, 1974. You have a Love Match compatibility score of +135. Imagine being in love with your soul mate. On the negative side, you are most incompatible with a person born on August 24, 1988. Your incompatibility score is -128. You’ll be like a cat and a dog on a love-hate relationship. Arf-arf, I want to bite you. Meow-meow, stay away from me! The number-one hit song in the U.S. at the day of your birth was Shadow Dancing by Andy Gibb as compiled by Billboard Hot 100 (June 17, 1978). Ask your parents if they know this popular song. How many babies were born on June 16, 1978? Base on the data published by the United Nations Population Division, an estimated 122,638,528 babies were born throughout the world in the year 1978. The estimated number of babies born on 16th June 1978 is 335,996. That’s equivalent to 233 babies every minute. Try to imagine if all of them are crying at the same time. What is the popular baby name on 16 Jun 1978? Here’s a quick list of all the fun birthday facts about June 16, 1978. Celebrities, famous birthdays, historical events, and past life were excluded. 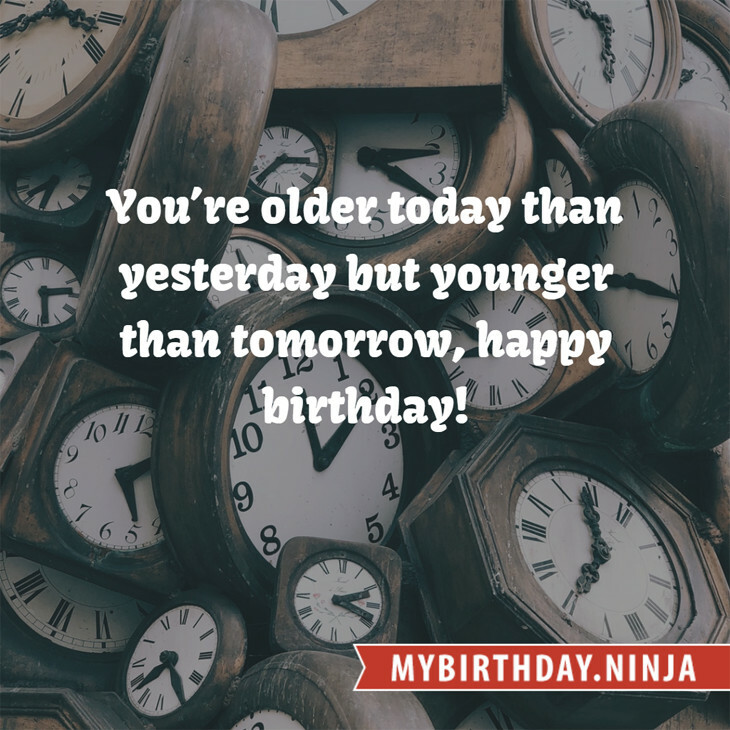 Try another birth date of someone you know or try the birthday of these celebrities: October 21, 1977 – Julieta Cardinali, Argentinian actress; February 1, 1939 – Claude François, Egyptian-French singer-songwriter and dancer (d. 1978); September 12, 1967 – Louis C.K., American comedian, actor, producer, and screenwriter.